Garden Themes for Grand Adventure in Your Garden – Great For Kids, Too! Want an outdoor activity to share with your child or grandchild that doesn’t require a referee or the risk of bodily injury? Why not spend some time with the young person(s) in your life working in the garden? 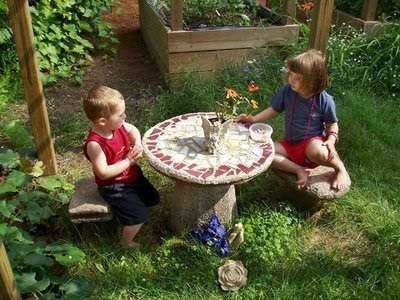 A garden is a great place for sharing meaningful time with children. Of course, if all they do is pull weeds in the vegetable patch they may not find it so enchanting so here are some ideas to liven up your yard by developing clever garden themes. Strategically placed bird feeders and clever bird baths make great invitations to feathered creatures to come and visit. 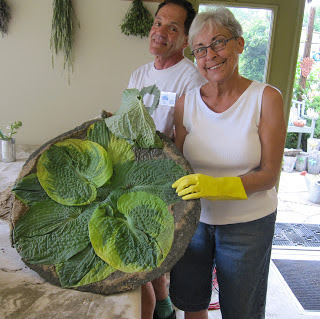 Try making a hypertufa leaf platter as a bird bath. It’s really more of a bird spa; when complete, it’s a gorgeous shallow water basin, and the leaves create the perfect sundeck for the birds to preen and relax. A short distance away place a comfortable bench, making sure it is in a shady spot so that the hot sun doesn’t shorten your outdoor time. Armed with a bird guide book, you and your youngster can enjoy the fun of identifying and observing birds and their unique habits. This same idea can work for butterflies too. Read together about the kinds of flowers and colors which attract butterflies and then plant them in the garden. You might include a sketchbook for your child to draw the different butterflies you have observed together. 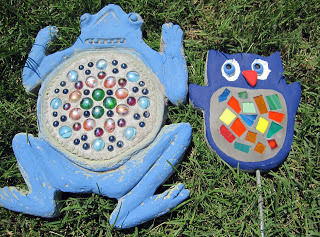 Children are fascinated by the world of imagination which is why fairy gardens and amazing fairy garden accessories make such a great project to enjoy together. Children will enjoy reading stories which include fairies or fairy-like creatures and then creating an imaginary world of their own where a pixie just might decide to live. 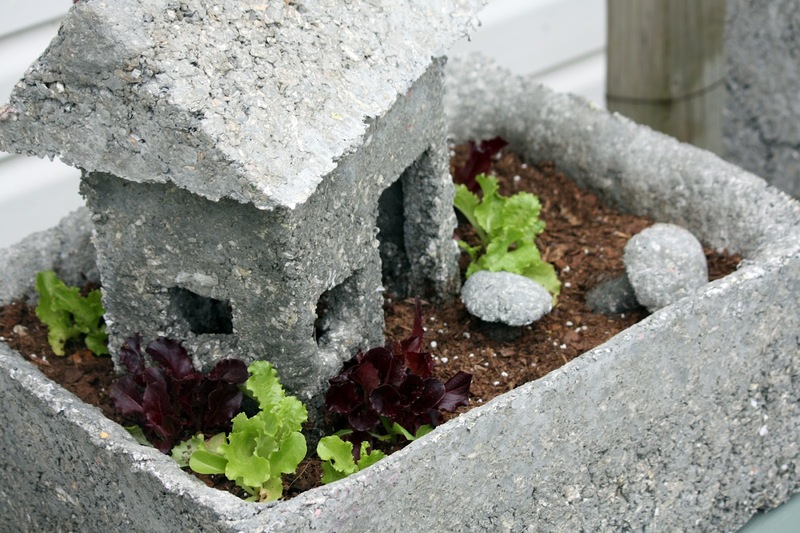 Constructing fairy houses and other fun elements for your garden will make lasting memories. Create a living passageway Children thrive on adventure and discovery, so give them someplace interesting in the back yard where imagination can take over. Trellis arches covered with clematis, star jasmine or sweet peas beckon children to enter another world on the other side. Another fun garden theme is to create a playhouse with four walls of giant sunflowers. We’ve even seen tepees constructed of plants. Make all of this even more fun by laying down your own custom garden stones, which lead youngsters step by step into the plant world of adventure. Make the garden a year-round festivalIf any of those ideas seem to large, then make your garden theme one of celebration. 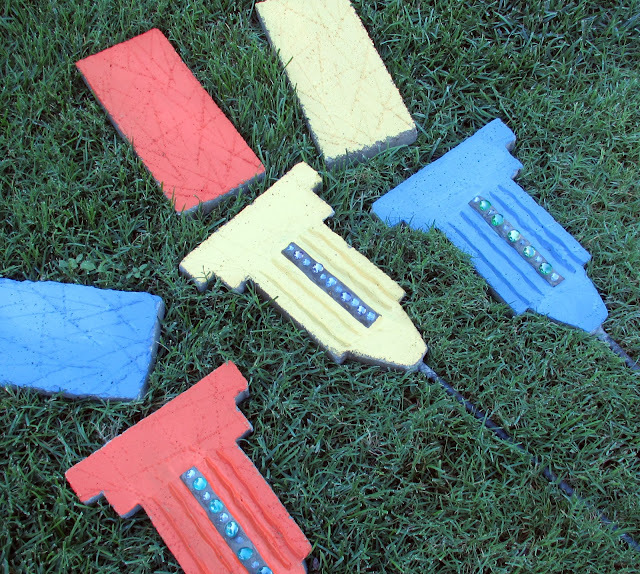 Be sure to mark the holidays with garden accents and creative garden stakes. You might plant flags in the garden around Memorial Day or the Fourth of July. Put out themed garden stakes at Christmas, Thanksgiving and Valentine’s Day. Make sure that kids are always interested in what is new in your garden all year long. 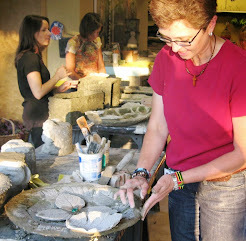 Making your own hypertufa bird spa, garden stakes, fairy accessories or concrete stepping stones at a From the Summer’s Garden studio event is another way to add adventure to your garden ... Sign up for a class today to start making memories! Cool Summer Project- Make a PEDESTAL STAKE! Varying height, an important element of design, adds variety, interest and rhythm within the garden. It can be accomplished with plantings, hardscape and decorative elements. Often I have a perfect piece of artwork to display but if placed on the ground it becomes lost among the lush growth. Height of some sort is needed to get the piece up and working as the desired focal point. If a large tree is growing in the right spot, it will sometimes serve this purpose. Most times though, there is no tree. This pedestal stake is an easy to make project that will raise diminutive pieces up closer to eye level or at least above surrounding plants. -4 10” x 16” pieces of 1 ½ inch thick insulation foam readily available at your home improvement store. You can even ask them to cut it to size for you! -1 bag sand topping mix in the yellow, red and black bag at your home improvement store. Goop Household Cement or other strong epoxy-type glue. 1. You will cast the pedestal stake in two separate pieces and join them later. The first is the upright panel and the second is the horizontal shelf to hold stuff. 2. Start with 2 of the 10 x 16 “ pieces of foam to make the mold for the vertical panel holding the rebar stake. Measure 2 inches in from all four sides of one piece of foam and mark a rectangle measuring 6” x 12”. Cut out this rectangle using the small hand saw. 3. 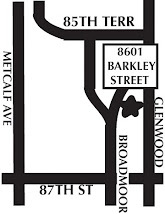 Set aside the cut-out piece from the middle. It is the outer frame that will serve as your mold. Find the halfway point along one of the short sides of this frame mold and make a line with the marker. Meaure ½” to either side of this center line. Cut a groove between the two outer lines to fit the rebar stake . 4. Repeat the procedure with the remaining two pieces of foam, omitting the groove. This piece will serve as the top shelf of the pedestal stake. 5. Match up the frame molds with their bottom pieces and stick them together using the large nails as pins. Position the nails about 2 inches apart all the way around the frame molds. 6. Brush the bottom and sides of each mold with oil or use baking spray. 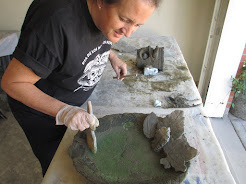 This will help your cast pieces to come away from the mold easily. 7. Mix up 1/2 bag of the sand concrete in the plastic pail using the trowl. Use enough water to make a thick concrete that keeps its shape when piled. Be careful not to add too much water. 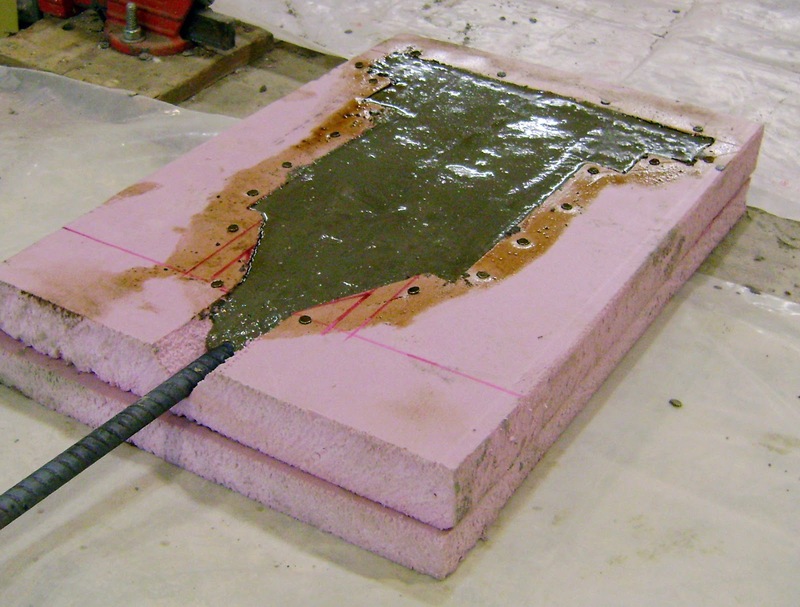 Watery concrete will not set correctly and will be weak. It will also seep out of the seams in the mold. Fill up each mold level with the frame mold edge. 8. Insert the rebar stake 1 inch below the top edge of the vertical piece and shimmy it down into the concrete until it rests in the groove at the bottom. Support the other end of the rebar with an extra piece of foam. 9. Allow the concrete to set and cure for three days. 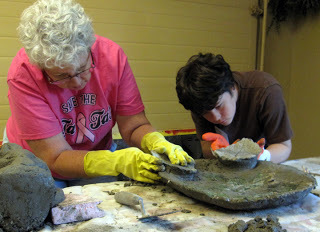 Use your trowl to remove the nails and gently lift the cast pieces from the mold. Smooth the edges with a brick or the edge of the trowl. 10. 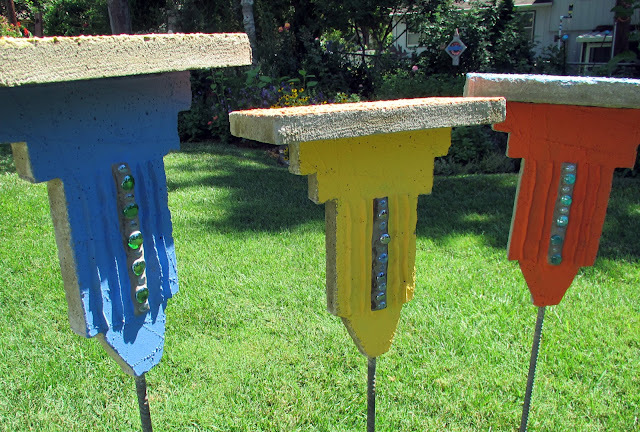 Now is the time to add color using exterior latex paint or mosaic to your pieces. 11. Stick the vertical upright of your pedestal stake firmly into the ground. Run a bead of exterior glue or epoxy along the top edge and center the shelf piece on top. Allow to dry overnight and you are ready to place your stake where you want it in the garden. TIP: Use your small hand saw to create a random texture in the bottom foam piece that will add interest to the surface of your pedestal stake pieces. Gently drag the teeth of the saw across the surface of the foam at random angles. This scratching will be picked up by the concrete and add interesting texture to your stake. TIP: You can add further design interest to the verticaL piece of your pedestal stake by cutting the foam in a “stairstep” pattern along the 12” sides and angling the bottom edge to meet the rebar stake. TIP: Add a mosaic glass design to the front of the pedestal stake for greater interest. 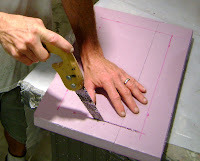 Use a craft knife to cut a channel in the foam piece to hold the glass pieces. When the cast piece comes out of the mold, use tile adheisive to attach the glass in the resulting groove. Allow to dry overnight and then grout with natural gray grout. 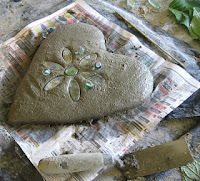 Concrete Mosaics - Shimmer and Shine! 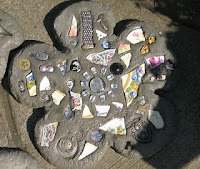 A concrete mosaic is like a treasure chest you create yourself, and it can really let your personality shine through. 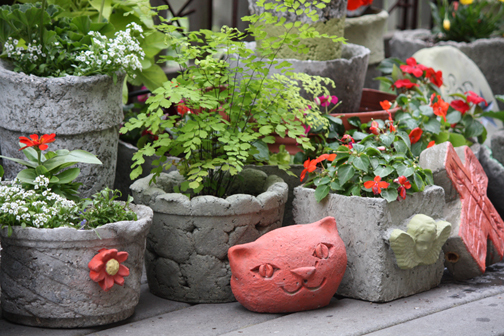 While you can vary your concrete garden pieces by using some that are purely rustic, adding a mosaic aspect to your garden ornaments adds a little flash n' dash to neutral surfaces. Inclusion of colored glass, marbles, dragon's tears and other found objects enhances the flat gray of concrete adding color, focus and interest. There are many way to work with concrete mosaics, but here are three I find myself using repeatedly. 1. The most simple and immediate is to insert the mosaic pieces directly into the concrete surface. Shaped glass pieces and marbles were used sparingly for this beautiful heart stepping stone. 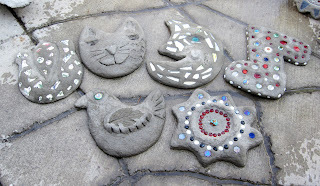 Found objects make good ornaments as well and can be easily set into the concrete surface. Broken china and buttons were used on this flower stone. 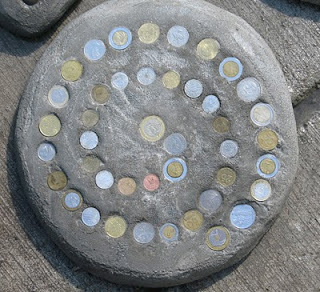 Coins collected on foreign travels create an interesting spiral in this example below. All three of these mosaics were created using the same technique. The basic shape is sculpted and formed into the desired design. The surface is smoothed and allowed to set for 5 minutes. In the meantime, the pieces that will form the mosaic design are selected and put together as they will be applied to the concrete surface. This is done in advance so that when it is time to insert them into the wet concrete, it can be done with dispatch as the concrete is continually getting harder and soon will be too hard to insert anything. The glass pieces are placed on the surface of the wet concrete and then each piece is carefully tapped to the level of the concrete surface. No need to be concerned if concrete smears onto the glass pieces. This can easily be cleaned off later. When the concrete has set and hardened, usually over night, a plastic or wire brush is used to clean off dried concrete residue on the glass pieces. Finally,the finished piece is hosed off and is ready for placement in the garden. 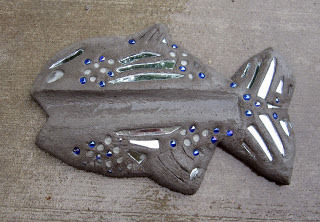 This unusual looking fish is made in a similar manner to a hand-sculpted stepping stone but will serve as a stone underneath a downspout to direct water away from the house. 2. 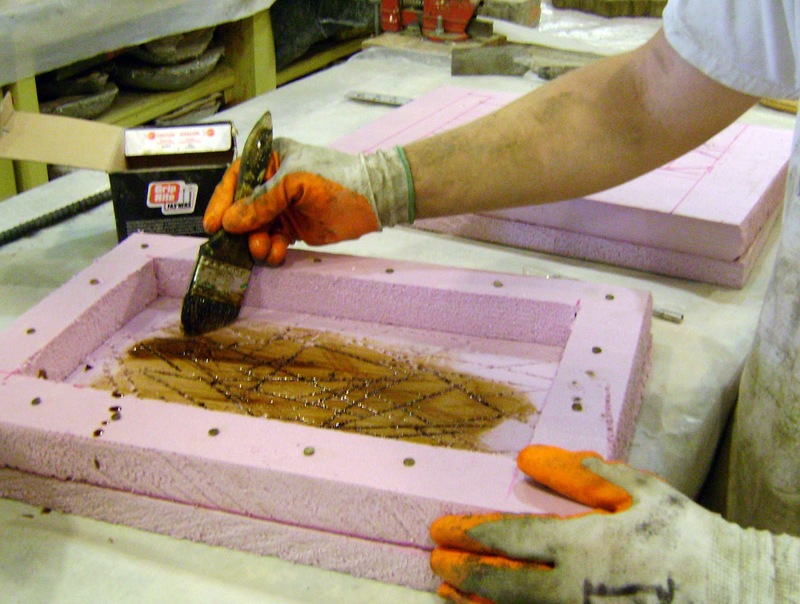 Another mosaic method involves casting a concrete piece designed with a recess for mosaic work. The frog stone is an example of this technique. The back of the frog is recessed for mosaic work. 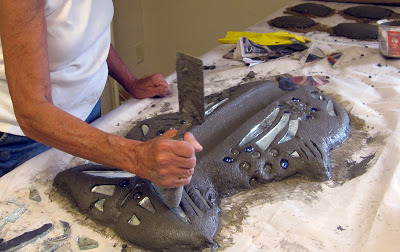 After it comes out of the mold and is cleaned, fresh concrete is mixed and poured into the recess and then the mosaic pieces are applied similar to the first method. 3. The little owl stake is an example of a third mosaic technique that offers the most control to the artist. Acrylic tile adhesive is applied to each piece of glass and then put in place on the owls body. The adhesive is allowed to dry overnight and then the mosaic is grouted with the same material used for tile floors and walls. Note: If you are a tufa fan, (hypertufa), you can also mix concrete and hypertufa for a custom piece, as we did for the Kansas City Live Art Attack. 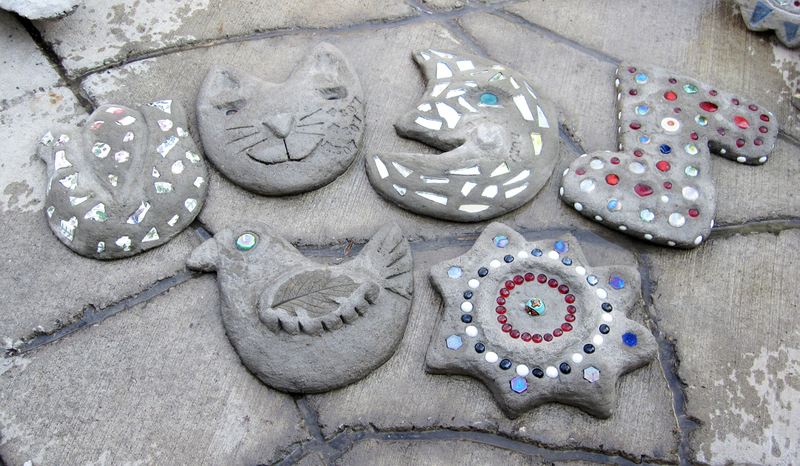 You can create your own beautiful mosaic pieces yourself, and they make excellent garden memorial pieces for honoring pets or loved ones. You can even try incorporating pieces of a cherished dish or ceramic item for a new way to display it. Learn more by contacting From the Summer's Garden today. Shine on! 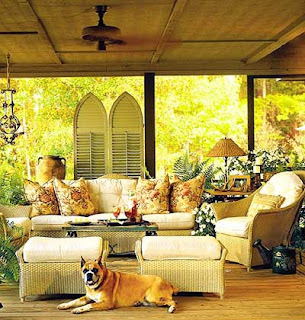 Ah, the outdoor living room – airy, refreshing, soothing, clever. 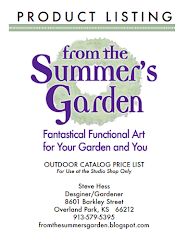 KC gardeners, decorators and crafters are taking the concept of outdoor living rooms to new levels this year. You can, too, with the right garden containers. Why not try a few of your own custom creations? This will make your outdoor living space one you crave time in and are glad to show off. No doubt, this year outdoor living rooms are getting more attention than ever with bright colors, bold patterns, textiles and seat covers; even pillows and rugs are complementing these colors. If you have a space with only a few walls, or a half-wall, no problem – accent it with decorative photo frames and put actual pictures in behind the glass. This can become a fun talking point and makes the space that much more special. One of the most important elements of your outdoor living room is the addition of unique garden containers. These can be a variety of textures, but recycled paper hypertufa makes an extra-special medium. You can create your own custom garden containers by mixing and shaping it, and then paint or decorate to match your color scheme. Hypertufa can be bright, rustic or weathered; it can be wildly-colored or calm and soothing – plus, plants love it for its breathability. You can even make a hypertufa garden container to use as a snack or drink stand, or a custom hypertufa intable, to be placed very neatly alongside your outdoor furniture. Choose a pattern with a wide base, then turn it upside down and set your favorite beverage on it for a useful conversation piece. You can even create amazing hypertufa platters for making your comfortable outdoor space the envy of the block. Want to get your hands dirty and make your own garden containers for your awesome outdoor living room? Come to the hypertufa studio workshop July 13 and 14 at From the Summer’s Garden. Your outdoor living space will be so much better for it!